EngagingPatients.org Patient Engagement is Critical for a Strong Culture of Patient Safety - Welcome to EngagingPatients.org! Readers of this blog likely know that for the past several years, the National Patient Safety Foundation’s Lucian Leape Institute has partnered with EngagingPatients.org in presenting the John Q. Sherman Awards for Excellence in Patient Engagement. The purpose of the award is to recognize organizations and individuals who excel at patient engagement efforts and to spread their best practices widely throughout health care. Experts have long recognized that patients and families have an important role to play when it comes to patient safety, yet many health care organizations still struggle with how best to achieve lasting and meaningful engagement with those they serve. Patient and family engagement is both a component and a byproduct of a strong culture of safety. By involving patients and families in care design, organizations can enhance the patient experience and reduce harm. 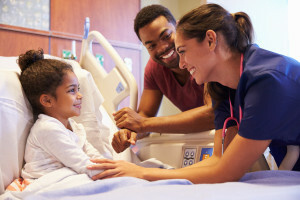 As found in a 2013 paper, “patient experience is positively associated with clinical effectiveness and patient safety.” Moreover, when patients and families are empowered as true partners—in bedside rounding, in the ability to report errors or call rapid response teams—it signals to everyone that safety is paramount. Clinicians can enhance patient engagement by using shared decision making strategies, considering health literacy limitations of their patients, and taking a patient-centric approach to care. Individual units led by strong managers can also institute tactics to help patients and families become involved in their care. But without strong leadership driving a robust culture of safety, it is difficult for organizations to achieve lasting and meaningful patient engagement throughout the system. A recent NPSF report, Free from Harm: Accelerating Patient Safety Improvement Fifteen Years after To Err Is Human, makes eight recommendations for improving patient safety, including partnering with patients and families. The report notes that “At its core, patient engagement is about the free flow of information to and from the patient.” It notes in particular that strong, committed leadership and a culture of safety really are the foundation for achieving all of our safety goals, including stronger patient engagement. These are not easy issues to tackle. Next month, at the NPSF Lucian Leape Institute 9th annual Forum & Keynote Dinner in Boston, we’ll take steps to address them in a collaborative setting of learning. We are looking forward to enlightening discussions particularly focused on driving a culture of safety and all are welcome. Editor’s Note: The 9th Annual NPSF Lucian Leape Institute Forum & Keynote dinner will feature noted patient safety expert Prof. Charles Vincent and Pamela Cipriano, PhD, RN, president of the American Nurses Association. For details, visit http://bit.ly/NPSFLLI9. Tejal K. Gandhi, MD, MPH, CPPS, is chief clinical and safety officer at the Institute for Healthcare Improvement (IHI). Previously, she was president and CEO of the National Patient Safety Foundation, which merged with IHI in May 2017. An internist and associate professor of medicine at Harvard Medical School, Gandhi was formerly the chief quality and safety officer at Partners Healthcare in Boston, Massachusetts. In 2009 she received the John M. Eisenberg Patient Safety and Quality Award for her contributions to understanding the epidemiology and possible prevention strategies for medical errors in the outpatient setting. Sign up for the weekly eDigest of our newest content.